UTRGV's Trevelle Hill pitches against Texas Tech during the third inning Tuesday, February 27, 2018, in Edinburg. EDINBURG – Some say the lights shine the brightest on Friday night football in Texas. In college baseball, however, those Friday night lights illuminate a duel on the diamond between the top pitchers from opposing teams desperate to give their squad an edge in the series-opening game. 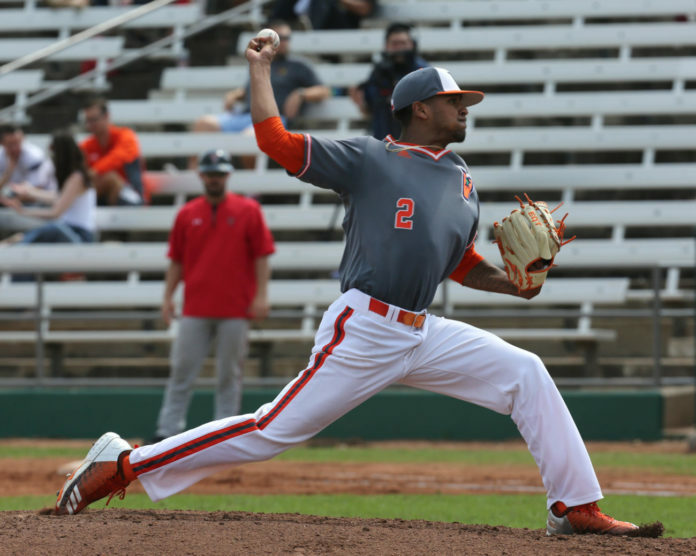 UTRGV (14-7) found their Friday night guy in Trevelle Hill, a 6-foot-3-inch right-handed pitcher from Tucson, Arizona who is in his second year with the Vaqueros after spending two seasons at Pima Community College. Hill, a senior, has shown tremendous strides since last season and has become the Vaqueros’ number-one threat on the mound, whether it be against a Western Athletic Conference foe or opponent from the Big 12. The best version of Hill has been on display early this year for the Vaqueros. He’s built a 4-1 record in five starts, which includes a 5-2 win over Oklahoma State and a complete game performance on the road against Kansas State. Last season, Hill started 12 games for UTRGV and finished with a 4-4 record. The UTRGV mindset has changed over the past two years. Coach Derek Matlock took over the program and has turned the Vaqueros into a competitive team that will battle to the last out, resulting in the winning culture. One example of that is Hill’s success to start the 2019 season. In 2018, Hill pitched 76.1 innings, appearing in 19 games for the Vaqueros. In that time, he struck out 46 batters and ended the year with a 4.60 ERA. This season, Hill has pitched just 32.2 innings, but has already racked up 35 strikeouts and a 2.48 ERA. Hill will lead the Vaqueros into their opening series of WAC play this weekend against Sacramento State, heading a three-man rotation with Conner Dotson, a graduate student from the University of West Virginia, and redshirt senior Jerred Quartier. By his own admission, Hill might have been a little too superstitious last year and let things get to him, but this season, he’s just letting things flow. You can catch him vibing out to tracks by Cardi B or Drake, trying to stay cool, calm and collected, but on the mound, he wants the lights to shine the brightest. UTRGV is set to begin conference play at 9 p.m. Friday with Hill on the mound as the Vaqueros travel to take on Sacramento State for a three-game series through Sunday.